North Walsham's Reeve's Lane towermill stood on Watch Hill next to the St. Nicholas's Iron works on the northeastern side of the town. A maltings was also run on the site. 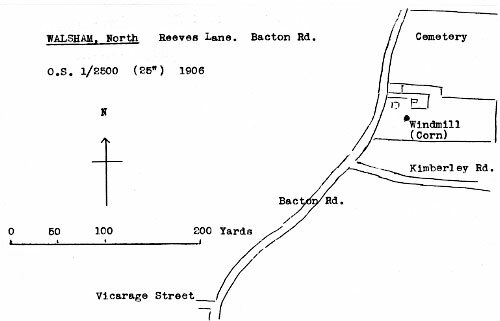 Reeve's Lane was later renamed Bacton Road. A Convenient Dwelling House with excellent Cellar, Barn, Stable and other Buildings, Yards, and Gardens and about one Acre of Land respectively adjoining; also a good brick TOWER WINDMILL with Going Geers, Malt Mill and Appurtenances and a Malt house with Steep and Kiln compleat. The above Premises are adjoining each other and are eligibly situates within a furlong of the Market Town of North Walsham and a good Milling Bag Trade and also a Malting and Porter Trade have been conducted thereon for nearly twenty years. The Mill and part of the other Buildings and Land are occupied by Mr. Tills as a yearly tenant and possession thereof may be had at Christmas next. Dwelling house, Malt house etc. lately occupied by Mr. Richard Pilgrim. The whole Lot is Copyhold of North Walsham, fine certain. Apply to Mr. Arthur Dalrymple, Solr. Norwich or Mr. S. Sadler Solr. North Walsham. A Dwelling House with excellent Cellar, Barn, Stables, Granaries, Gardens etc. 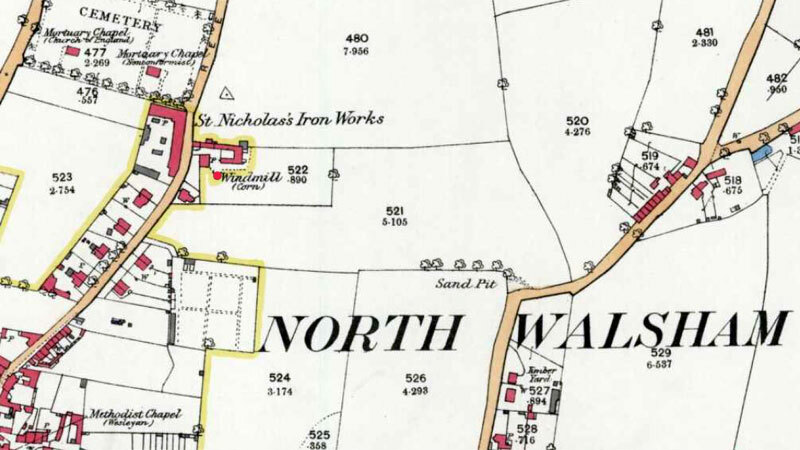 Also a good Brick Tower Windmill with Going Geers, Malt mill and Appurtenances, a Malt house with Steep and Kiln and an acre of Land (inclusive) all adjoining each other, near the Market Town of North Walsham and 3 furlongs from the Yarmouth Canal. On these Premises a good Business in the Milling, Bag, Malting and Porter Trades has been conducted for many years. Also a Grocer's shop in full trade and several cottages in and near the Town of North Walsham. Apply to Mr. Sadler,. North Walsham, Solr. for the Vendors. NORTH WALSHAM. Accident. On Wednesday morning an accident happened at the tower mill belonging to Mr. Tills of North Walsham resulting in damage of from £80 to £100. Whilst the mill was at work the shaft gave way and the sails came to the ground with great violence, by which they were considerably broken. Fortunately no one was near the spot at the time. TO BE SOLD, a Brick TOWER_WINDMILL, Patent Sails, Steam Gears attached, with DWELLING HOUSE, Barn, Stable, Outbuildings & 3 Acres of Land. For particulars apply to Mr. Thos. Tills, North Walsham. A TOWER WINDMILL with Dwelling house, Premises, Garden and Land occupied by Mr. Tills above Thirty Years. Apply to Mr. W. Cooper, New Mills, North Walsham. 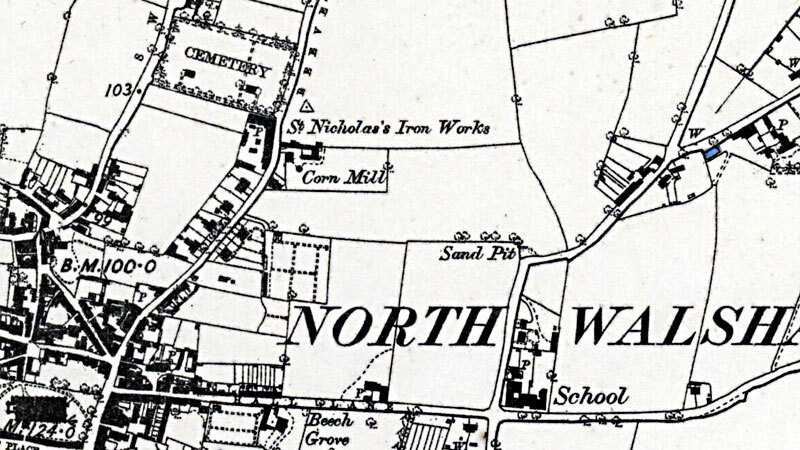 All that BRICK TOWER WINDMILL, Granary, Dwelling house, outbuildings and Pightle of Land containing altogether one acre one rood, situate in Reeves Lane, near the Town and now in the occupation of Mr. Benjamin Johnson. 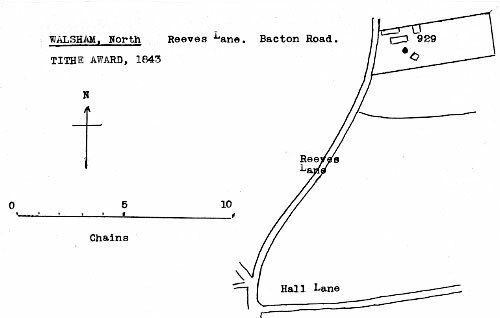 Copy hold of the Manor of North Walsham. Fine certain. Possession of both Lots to be had on the 11th October next. Apply to Mr. Forster, Solicitor, Aylsham or the Auctioneer, North Walsham.